On July 28th, 1914 the Archduke Ferdinand of Austria-Hungary and his wife were assassinated. Because of this event Austria-Hungary declared war on Serbia, and World War I began. To some of us World I War seems so distant and remote. Very few veterans from that conflict are still alive and the story of the war is not one that most people are familiar with. The war did have a huge impact on the world however. Not only was it the first of the 'modern' wars but it also was the reason why World War II began. Through the Looking Glass has a collection of reviews about WWI books that you might like a to take a look at on the World War I feature page. The books reviewed suit a number of age ranges - from picture books to novels. One in particular, Hattie Big Sky, stands out. This Newbery Honor award winning title explores the ways in which one young woman is touched by the clouds of war. Though she lives in Montana in distant America, far from the battle grounds in France and Belgium, Hattie still learns how terrible war is and how conflict can, at times, bring out the worst, and the best, in people. 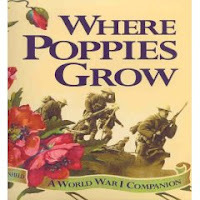 In Where Poppies Grow: A World War I Companion, by Linda Granfield, the author tells the story of World War I with great skill, capturing the initial innocence of the soldiers and the rude awakening that they got when they finally found themselves in battle. Do take a look at this feature, and if you know of more World War I books for children that you have read and liked, tell me about them. Beatrix Potter is loving the days that she is spending on her farm, and all is relatively quiet in her little English village. Then she finds a basket on her doorstep containing a baby. No one knows where the baby came from, though many of the villagers believe that the infant either belongs to, or was stolen by, the gypsies. The animals in the district know more about the provenance of Baby Flora but alas no one bothers to ask them their opinion. Meanwhile Jemima Puddleduck, the white duck who barely escaped with her life when a fox set a trap for her, is sitting on a hidden clutch of eggs. For some reason the eggs are refusing to hatch and poor Jemima does not know what to do. With great skill Susan Albert combines fact, fiction, and fantasy in this novel to create a story that is thought-povoking, entertaining, and which also gives readers a picture of what Beatrix Potter's life was like. Being a huge admirer of Beatrix Potter and her work, I am always delighted to discover that Susan Albert has added another book to this unique series. 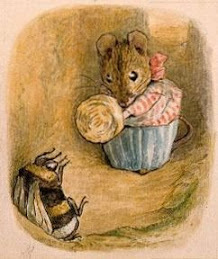 Do take a look at the Cottage Tales of Beatrix Potter website. Here you will find further information about the series, a newsletter for fans of the books, and much more. Through the Looking Glass has reviewed other books by, and about, Beatrix Potter. You can find these reviews on the Beatrix Potter page. Because of my reviewing work I recieve a lot of email newsletters and in some of these I have found information about some interesting contests and events that I think you might like to know about. If you have a teen in the house you might like to tell them about Teen Read Week which this year is from October 12th though October 18th. This years topic is Books with Bite. Talk to your local or school librarian to find out if they are participating. You can get more information about the event on the Teen Read Week website. Do let me know if have heard about contests or events that might be of interest to my readers. Summer is, for most of us, a time of year when life slows down a little. Children are out of school and parents don't spend quite so much time going to and from after-school activities and events. Summer is also a time when many families go on vacation. Some people are lucky enough to go abroad while others take a break by going to the beach, hiking in the mountains, or visiting places of interest in their own country. To celebrate summer and summer activities Through the Looking Glass Book Review has a number of features that might interest you. There is the Summer Days feature. Here there are reviews of summer related books of all kinds. Then there is the Days at the Beach feature where readers will find reviews of beachy books. There are picture books, board books, and more. If you are off to the beach this summer you might like to heighten the experience by reading a few of these titles. In addition, for the July issue of Through the Looking Glass Book Review, I have reviewed some wonderful vacation books. 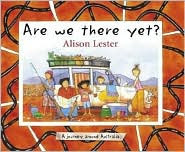 Are we there yet: A journey around Australia is beautifully illustrated and it takes readers on a fabulous trip around Australia in the company of a family who are not afraid of adventures. In the Bush: Our holiday at Wombat Flat is also from Australia and it will delight readers who enjoy books that are full of detailed illustrations. The text is minimal and there are many amusing things to find in the artwork. For older readers Travels with my family will leave you in stitches. In this title two little boys are taken on a variety of very unconventional vacations and they have some very unusual adventures and misadventures. The book is written in such a way that older readers will also enjoy it. It is therefore a perfect title to read out loud. One could read the book during a long car ride or while sitting around a campfire. For children who are going to camp this summer A couple of boys have the best week ever is a must. This book will certainly bring a smile to the face of any reader. Children will want to read it again and again. These days the skies above my town are full of smoke from the Northern California fires which are still burning to the south of us. The fires remind me that we are truly at the mercy of the weather when it chooses to turn nasty. In this case lightening strikes caused numerous fires to begin and now, many days after the storm, we still have not been able to put the fires out. In the new issue of Though the Looking Glass Book Review we look at books that explore the world's weather and the effect that the weather has on our lives. There are books about tornadoes, hurricanes, storms, wind, rain and snow. The titles that have been reviewed are suitable for children of all ages, from children who are very young to those who are in their teenage years. You can find the weather feature on this page on the Through the Looking Glass Book Review website. Also take a look out the Editor's Choice title for this month. Sand Dollar Summer by Kimberly K. Jones is a marvelous book that explores how a young girl, Lise, adjusts to huge changes in her life. She wants everything to stay just as it is but when her mother gets injured in a car crash Lise's life is turned upside down. She and her family go to spend the summer in a ramshackle house on the Maine coast and Lise hates everything about the place. She dislikes the cold water, the sand drives her crazy, and worst of all her mother is not herself at all. Lise feels very lonely and angry and she wants everything to be the way it was before her mother was injured. This is a very moving and thought provoking book, and I cannot recommend it highy enough for readers who are twelve and up.